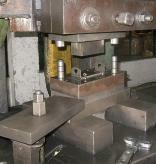 We design and produce dies in our own factory and supply though partnering with other manufacturers. Example of HAND DIE SET: Operator sets blank into die. Part falls through die into parts catcher. Example of HAND Compound Die Blanks and perforates a part at the same time. In most cases this operation perforates a hole or holes down, while the part blanks up. Slugs from those holes fall through the die. Operator or Pneumatics then ejects blank.